During his 28 year career in teaching and administration in both elementary and higher education in California, Paul and his wife LuAnn caught the Community Theatre bug from a friend who encouraged them to join her in volunteering in local theatres. After retiring from the State of California and moving to Hawaii, Paul found himself working at Leeward Community College as Dean of Academic Services, where one of his responsibilities was oversight of the Leeward Theatre. During this time, he was introduced to a relatively new Theatre Company, PlayBuilders, and soon they became Artists in Residence at Leeward Theatre. Paul has since retired, again, and enjoys spending time with his three grandchildren, working with PlayBuilders and enjoying his new home, Hawaii. If you look hard enough, you might catch him very early on Saturday mornings kayaking near Ala Moana. When Donna arrived in Hawai’i 20 years ago, it was with the idea that her family would spend two years here before moving on to her husband’s next assignment. By the end of the first year, however, she was telling friends that they would have to drag her kicking and screaming onto a plane to leave. And so, the family stayed. In 1993, Donna began a 15-year career, first as faculty then as Chief Academic Officer, at TransPacific Hawaii College in Aina Haina. During that time, she received her MA in ESL from the University of Hawai'i at Manoa. Donna also has a Master’s Degree in Urban Studies from Old Dominion University. From 2008-2012, she served as the Executive Director of the Atherton YMCA, a Campus Y, adjacent to UH. Her last and only starring role was la Princesse de Navarre in the eponymous play by Jean-Philippe Rameau. Staged in French by the Department of Foreign Languages, the play was performed at the University of Louisville. Deanna Espinas was born and raised in Honolulu and currently resides in Palolo Valley. 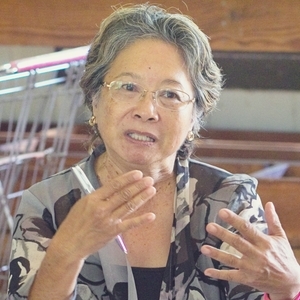 She worked for the Department of Public Safety for over 31 years as a correctional librarian, and retired in January 2014.She serves on the board of directors for Hawaii's Plantation Village, the Filipino-American Historical Society of Hawaii, Friends of the Library for the Blind and Physically Handicapped, and Hawaii People's Fund. She enjoys participating in a variety of cultural activities which celebrate people's experiences growing up in Hawaii. She is a member of Keolumana United Methodist Church, Faith Action for Community Equity, and just began her term on the Hawaii District Board of United Methodist Women. Espinas believes that stories of family and friends who were born in the Philippines and struggled to make a new home for themselves here and elsewhere are fascinating. All stories shared become movies for the mind. There is an opportunity to imagine the actors, hear their voices, see what they wore, ate, and feel their emotions; these are memories to be passed on to our children. Fabian Lewis is a United States Army Veteran and Chaminade University MBA graduate. Collaborative leader with 5 years of experience with increasing responsibility in healthcare organizations. Roles have included team leader, department supervisor, program manager, committee member and trainer. His proven track record of success has resulted in multiple awards and decorations for military service and academic achievement. Norma was featured in PlayBuilders’ very first community based play, Wahiawa, Remembah Wen… and also participated in the Po’okela Award winning production ofHouseless in Paradise. She is a special education teacher and currently teaches drama at Aliamanu Middle School in Salt Lake. She has a Bachelors of Business degree from the University of Hawaii and a Masters in Special Education from the University of Phoenix. She served 10 years in the U.S. Army, Air Defense Artillery and was honorably discharged as a Captain. She and her husband, Robert E. Combs, have been married for 26 years and have a daughter, Leilani Lariing Combs, and a 2 year old Chihuahua terrier, Paco. Kenneth Choy was born and raised in Hong Kong and moved to Hawaii with his family 15 years ago. He attended St. Louis Schools and earned his degree in Bachelor of Science at University of Hawaii at Manoa. Afterward, Ken stayed on the island and worked for a non-profit art organization, Hawai’i Arts Alliance, while engaged in a number of community projects that focuses on building social adhesion through the arts. In college, he also started a group called Mino’aka Project, whose mission is to recruit pre-dental students and organize events to raise awareness of oral health in underserved or primarily immigrant communities. That remains his passion and a project that he is continuing today. Ken maintains a private practice as a specialist in the field of periodontics at Ala Moana. Since founding PlayBuilders, Terri has spearheaded seven original community-based plays including "Someone Else’s Slippahs, Chinatown", “Wahiawa, Remembah Wen", “Yes, I am; Stories from Honolulu’s LGBTQ Community”, “Yes I Am: Leeward Edition”, “Houseless in Paradise”, “The Waipahu Project”, and "Dragonfly, The Story of a Young Local Girl's Journey Through Foster Care”. For all PlayBuilders' projects, Terri has formed important community partnerships with organizations such as the Wahiawa Historic Society, Catholic Charities Hawaii, Waipahu Community Coalition, the Foster Care Training Committee, Hawai’i State Department of Health, Leeward Community College, The Waianae Comprehensive Health Center, the Mele Program of Honolulu Community College, Hawaii Pacific University, Nanakuli High and Intermediate School, Hawaiian Mission Houses Historic Site and Archives, and the Domestic Violence Action Center. All of Terri’s work with PlayBuilders is original and she works closely with community members on each project to insure that the stories they share with PlayBuilders are shaped into a play they approve of and can be proud of.